Not all trampolines come with spring or frame pads, but we think they’re a great idea. help prevent injury if someone lands on the springs after a poorly aimed bounce – it’s much nicer to land on pads! serve as a visual boundary for those bouncing – spring/frame pads are usually a bright, contrasting colour that stands out against both the black mat and the colour of the surrounding ground. This helps bouncers stay on the trampoline! 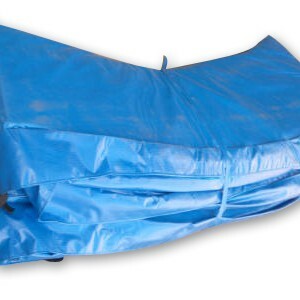 The lifespan of these pads varies greatly depending on useage and climate, but you can generally expect them to last between one and three years.